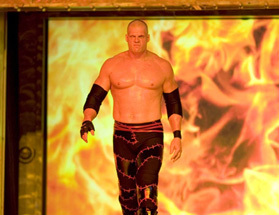 144/159 David Mumpower Kane does nothing different than his wrestling schtick. The movie comes across as a student film with a C- grade rather than a major studio release. After establishing itself as the dominant force in wrestling entertainment, absorbing any comers to the scene with ruthlessness and aplomb, Vince McMahon's WWE has expanded to other venues. Videogames and toys have long been the natural tie-ins for the franchise, but with the popularity of Dwayne "The Rock" Johnson, the time came when the McMahon family recognized that they could potentially capitalize on some of their talent as they became involved in movie productions. After all, wrestlers like Jesse Ventura, Rowdy Roddy Piper and Hulk Hogan had found some degree of success in this avenue, so why would the WWE not capture a piece of the pie for themselves? They started out with production company credits on The Rundown and Walking Tall, both of which starred The Rock. Since Mr. Johnson outgrew them to some degree since he's an able crossover performer, the WWE realized that they would need to create some starring roles for some of their other featured wrestlers. One such film is The Marine, which will star current top-of-the-line guy John Cena. There are also projects in the line for Stone Cold Steve Austin (who was in 2005's The Longest Yard) and bad guy Triple H (who had a goofy role in Blade: Trinity).